Custom exhibition designs with a strong visual identity give an organization its own look, makes the company identifiable, increase the company’s importance. Only a specialized exhibition design company will be able to implement in the exhibition booth design the brand characteristics. What is is a key issue especially in today’s busy markets, where the exhibitor can get lost in the trade show crowd. While it is not easy to join a trade show and manage an exhibition stand, doing so can certainly produce remarkable results and propel a product or service to success. A carefully designed exhibition stand concept together with a carefully planned trading strategy improves four key essential business areas simultaneously, making a trade show slot a smart and worthwhile investment. 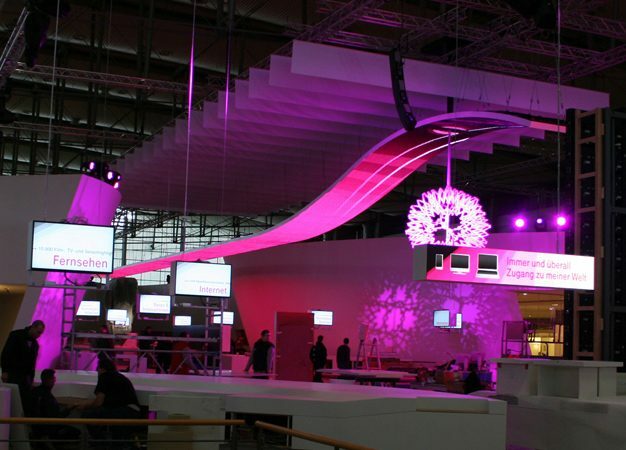 The exhibition design company will be an essential component to create a concept that will bring customers into your stand and attempting to keep them there. The design you select will greatly affect the stand look and the kind of consumers who will be drawn in. Subtle design decisions might play a vital part in how a customer perceives your stand, so think about every appearance of what will be entering into your stand. Develop a new design concept customized to your operations and targets. Innovative concepts created to increase customer relationships, deliver a certain desired experience, content, images, and experiences that enhance a connection between the company and potential customers.